The Jamaican musician and messenger Bob Marley introduced reggae to the world, and with it, a positive, compassionate, and realistic rebel spirit that has magnetized an ever growing army of devotees in the quarter century since his passing. In her original and insightful THE BOOK OF EXODUS (Three Rivers Press / May 2, 2006 / $14.95), author Vivien Goldman, who chronicled Marley’s rise in the 1970s, offers an intimate, first-hand picture of a pivotal period for Marley: the 1976 assassination attempt on his life, and the period of exile he then spent in London, recording Exodus, culminating in his triumphant return to Jamaica at the Peace Concert of 1978. As a British music journalist, Vivien Goldman was influential in introducing mass audiences to the Rasta sounds of Bob Marley. Working first, as his PR, then as a writer, Goldman was uniquely placed to observe both the development of Bob Marley and his band, the Wailers, and the rise of “conscious” reggae in its Golden Age. So close was Vivien to Bob and the Wailers that she was a guest at his Kingston home just days before gunmen broke in to kill “The Skip,” and was often by his side while Exodus was being made. Now, in THE BOOK OF EXODUS, Goldman chronicles the making of this landmark recording, from its conception in politically torn Jamaica to the cathartic release of energized, intense all-night studio recording sessions in London. But THE BOOK OF EXODUS is so much more than a regular biography or making-of-an-album story. This remarkable work takes us through the history of Jamaican music and politics, as well as Marley’s own personal journey from the Trench Town ghetto to his status as global superstar. Exploring the album’s spiritual dimension, Goldman examines Marley’s faith, Rastafari, and its roots. 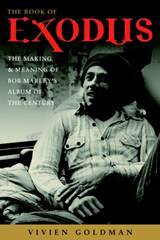 To trace the biblical themes of the Exodus story and their meaning today, Goldman includes words of wisdom from Marley’s Rasta guru, Mortimo Planno, and leaders of different faiths; and also examines other musicians who’ve interpreted Exodus, from Rossini to Schoenberg and Isaac Hayes, leading up to the Wailers’ own Exodus. Released in 1977, just as reggae’s fellow rebel music, punk, was blooming, the Exodus song cycle includes majestic Marley classics like "Three Little Birds," “One Love,” "Jamming," "Waiting in Vain," and, of course, the "Exodus" anthem itself. A pivotal recording in his career, Exodus propelled Marley to the international superstardom he craved, to spread the message of Rasta in groundbreaking island rhythms. This inspirational record expresses a universal tale of pain and hope; of a challenging journey from slavery to freedom, that was first recorded in the Old Testament but grew to resonate in historic flashpoints like the Jewish flight from the Nazis, and the Civil Rights movement. This archetypal narrative only grows in meaning in today’s conflicted world. The political and human story behind the traumatic assassination attempt on Bob’s life by gunmen who invaded his Kingston home. Bob’s life in the Trenchtown ghetto and the uptown communal household he established at Hope Road in Kingston; and the band’s very different existence in exile. Bob’s complex emotional life, and his relationship with Jamaican Miss World, Cindy Breakspeare, the mother of current chart-topper, Damian Marley. From that privileged perspective, Vivien Goldman now shares the definitive book of her career, a study of Bob Marley’s crucial recording Exodus, voted "The Album of the Century" by Time magazine in 1999. Essential reading for anyone who enjoys Marley, this book will also turn the uninitiated on to the work and beliefs of one of the most significant artists of any century. Vivien Goldman is a widely anthologized writer, broadcaster, and musician who has devoted much of her work to Afro-Caribbean and global music. Her journalism has appeared in the New York Times, Village Voice, Rolling Stone, Spin, Interview, the Daily Telegraph, and Harper’s Bazaar. She is the professor of punk and reggae at NYU’s Clive Davis Department of Recorded Music. Originally from London, Goldman now resides in New York City. This is her fifth book.